We are well known for our inclination for investments in fixed deposits. When we think of fixed deposits, we generally go to the banks, post offices for the investment. There are other avenues also where we can think of investing. Some of the financial companies offer fixed deposits with high interest. These are mostly considered by senior citizens to attract more return. The deposits are used as regular income stream by them as it fetches quarterly or monthly interest to investors. We will discuss the advantages, risks and what you should know before investing in company fixed deposits. 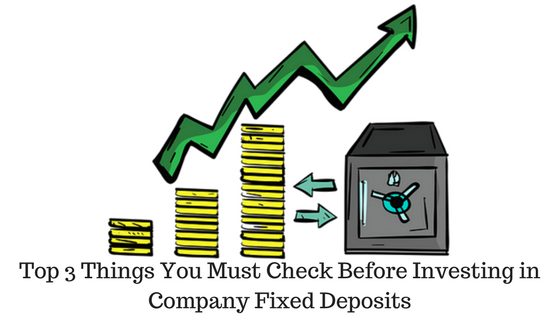 What is Company Fixed Deposit? The fixed deposits offered by financial Organisation and Non-banking financial companies (NBFC) for a fixed tenure with a fixed rate of return. Some of the popular fixed deposits are DHFL Ashray Deposit Plus, Shriram transport finance Unnati FD scheme etc. The companies are offering the high interest rates to the investors to arrange the money which is required for their business. Bank deposits are offered by banks and it attracts less interest than the company fixed deposits. Bank deposits don’t have the rating from rating agencies whereas company fixed deposits are rated by the agencies according to the risk and other factors. The company fixed deposits are less secured than the bank fixed deposits. Bank deposits are insured of up to Rs 1 lakh and company deposits does not have any insurance. Banks are regulated by Reserve Bank of India (RBI) and hence, the deposits are also as per the RBI guidelines. Company fixed deposits are as per the company rule and guidelines. Banks are not defaulting to pay interest at the time of maturity whereas there are many instances where companies were defaulting the payment to deposit subscribers. The only advantage of subscribing a company fixed deposit is the higher interest rate and in turn better return on invested money. But it involves more risk than the bank deposit. Now, are you ready to take the risk for a better return? Most of the subscribers goes for these investment as because it is a fixed deposit and they think that they will get money as the bank fixed deposit. Most of the investors are ignorant about the risks associated with it. One should invest in these deposits by knowing all the risks and fears involved to it. Companies can be default of paying the maturity amount at the end of the tenure if the financial condition of the company becomes bad. The company may be running out of cash at the time of maturity and are not in a position to give the maturity amount to the subscribers. You should check the rating of the deposits given by different rating agencies before investing. You have heard of the case of Helios & Matheson and Jaiprakash Associates. They are default of paying the maturity amount to the investors. H&M has collected Rs 55.25 crore from the investors across the country but they are unable to pay to the investors back. The Bank deposits are combined with Rs 1 lakh cover from RBI. If your bank has become default of paying the maturity amount, RBI will give you up to Rs 1 lakhs for the deposits. The company deposits have no cover or security like this. The company deposits are not easily liquidable. Once you invest the money to the deposits, you cannot get the money if you require during an emergency. You have to wait for the full time till maturity. Whereas the bank fixed deposits can be easily liquidable. You can break the deposits and have the money in your savings bank account instantly. If you have internet banking facility it is even easier and comfortable and you can do it sitting at home. Performance of the company – You should thoroughly check the financial performance of the company before investing in the deposits. Normally the company requires the money for their expansion of business. So, check the company’s plan of growth and how they will return the money during the maturity of the deposits. Look at the balance sheet and cash flow statement for analysis of the company. Past performance of the company is also important in this regard. The company which are regular in paying dividends and have a good track record of paying back the maturity amount is more reliable than others. Rate of Interest – Generally companies are offering better interest rate than the banks. The banks are offering the interest rate of 7%-9% interest rate whereas companies are offering 9% to 16% interest to lure the investors. Up to 15% interest rate is ok for these type of deposits. The high interest rate sometimes is doubtful. The company may be facing shortage of funds and wants some easy money from the market. This can be difficult for them to pay back to investors. Rating from Rating agencies – It would be wiser to check the rating of the deposits from rating agencies to check the risks associated with it. CRISIL and ICRA are two leading rating agencies in India. CRISIL has seven primary categories of rating. On these categories they can put +, – for differentiating further. You can see the various grades and their meaning for CRISIL rating. ICRA has different grading system for Long term, medium term and short term deposits. The long term rating scale is applicable for these company deposits where the maturity is more than one year. Should you invest in Company fixed deposits? As it has been discussed in the article that, this company fixed deposits are popular amongst the senior citizens and those persons who are making a distance from the equity market. Those persons are also happy with the term fixed deposit though it is actually a riskier than normal bank fixed deposit. It can be placed between equity and bank fixed deposit in terms of risk. If you want return with taking less risk than equity, you can think of these deposits. But I should remind you to check the company performance, management and ratings on the deposits by rating agencies. Understand the product thoroughly. If some deposits are giving very high return, do a crosscheck, analyze the reason. If you are happy about the return with risk, then go for it. In my view, equity is better than these deposits because it can give more return. When you are analyzing a company and its financials why are you not for direct ownership of the company by investing in stocks? If you are not comfortable with trading of stocks, you have option of investing in equity mutual fund.